We’re excited to announce the launch of our new logo, color scheme, mascot and a brand new Mainstreethost.com! After 19 years, we are saying goodbye to our familiar globe logo and have released an updated identity as part of the ongoing evolution of the Mainstreethost brand. You will start seeing our new look around the web and everywhere we’re out in public. We believe our new branding better suits the agency we have progressed into since 1999. Our new brand represents a simple, flexible, affordable digital marketing agency. As we continue to grow and update our digital marketing services, we wanted our brand to better reflect who we are, why we exist and where we’re headed. After thorough testing, trials and careful consideration we have reached a fresh, modern look that resonates with our identity. The intricacies of a rebrand often involve a bit of a balancing act. With careful attention to detail and permission to start from scratch, we set out to re-envision everything that represents Mainstreethost. From understanding who our best customers are, to re-establishing the core beliefs of the company, we wanted to utilize this opportunity to deliver the optimal experience for our valued customers. Our digital marketing agency is focused on delivering high-performing digital marketing campaigns that are: simple, flexible & affordable. Simple. We offer an approachable product line with clear objectives. Our goal is to make digital marketing simple for our customers to understand, get started and achieve results. Flexible. We are willing to accommodate our customers’ needs and adapt our offerings to best suit our customers. We’re agile, we offer the strength of a large agency, with the flexibility of a small company that is willing to adapt to our customers’ requests. Affordable. We offer digital marketing services that accommodate any price point. Our agency features a unique ability to provide result-driven, affordable digital marketing services. Creating a new logo presented numerous challenges. We wanted to concisely convey the foundational elements of our company, while maintaining familiarity, simplicity and clarity. We needed to make it known that we are a digital marketing agency that is friendly, flexible, and places our customers first. Our name, Mainstreethost, gave us a unique opportunity to tie our 5 core services to the 5 points of the M.
Building off of this concept we evaluated the pillars of our digital marketing agency. SEO, PPC, Web Design, Social Media & Content Marketing. This gave us a platform to start creating logo concepts. Our designer created over 115 versions of the M logo. We explored numerous concepts to achieve the right emotion for our company. We had several logos progress to the final rounds, but decided they didn’t quite match the vision of our executive team. We knew we wanted to utilize the M of Mainstreethost as part of our new logo, but needed to find a balance of creativity, simplicity and character. Our team went back to the drawing board and continued to flesh out a full concept for our rebrand. 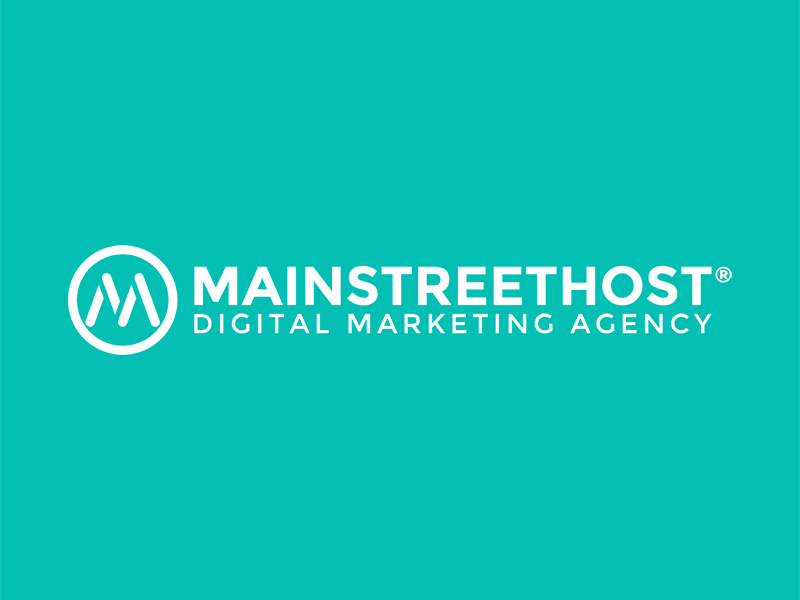 As part of the new look for the Mainstreethost brand, we chose to update our core colors. Knowing that our previous look had often been perceived as dark and uninviting, we wanted to use modern colors that were energetic, friendly and representative of who we are. Building off of the 5 pillars of the M, we set out to establish a well thought-out meaning behind each color we chose. Green is typically associated with nature and growth, and made it an ideal color to represent our SEO services. The goal for each of our SEO services is to foster sustained organic growth for the clients we work with. Blue is synonymous with intelligence, wisdom and dependably. These adjectives represent how we approach our web design services. We look to have an intelligent design concept, based on expertise and wisdom gained from our customers’ goals. The end result, is an effective website that is a dependable ambassador for our client’s business. Orange is a secondary color that combines the energy of red with the happiness of yellow, producing an attractive and cheerful hue. We chose orange to represent our social media marketing services as we strive to have our clients audiences feel these positive emotions when engaging with our social media postings. Red represents passion, excitement, intensity and energy, making it the optimal color for our content marketing services. The intense and powerful emotions we aim to create with our copywriting services should only be matched by the passion our writers have for creating it. Purple combines the stability of blue and energy of red while exuding sophistication and power, a highly representative color for our pay-per-click marketing services. Mainstreethost provides the stability of experienced PPC management combined with the energy to attract clicks and the power to grow your business though paid advertising channels. Turquoise represents simplicity, inspiration, balance and clarity. Our brand strives to maintain a positive experience for all of our customers through a strong balance of inspiring services, by offering simple digital marketing plans for any budget while providing clear expectations. Accompanying the branding change at Mainstreethost, we also unveiled a new mascot. As part of the evolution of our brand, our robot embodies the personality and shared roots of search engine optimization. Our digital marketing agency was founded on SEO, and robots or bots have always been associated with the driving force behind major search engines. Our team found this union endearing and fell in love with the concept. Our talented designer started creating some working concepts and we began to build our robot. We unveiled our new mascot last night, and commenced a contest for our employees to help name our bot. We’ll announce the name in the coming weeks at the close of the contest. In the meantime, you can check out our robots personality, and how he assists our digital marketing services throughout our new website. Today, we’re taking a bold step forward with our updated look. This marks a new chapter in our continued pursuit of delivering a full-suite of comprehensive affordable digital marketing services. We hope you enjoy our new logo and website! Be on the look-out for continued updates to our marketing services—as we continue to try and better serve our customers with simple, flexible and affordable digital marketing.